Early splitting husks in walnuts are oilless nuts. They can be recognized by the early husk split and dark pellicle with white nut meat. 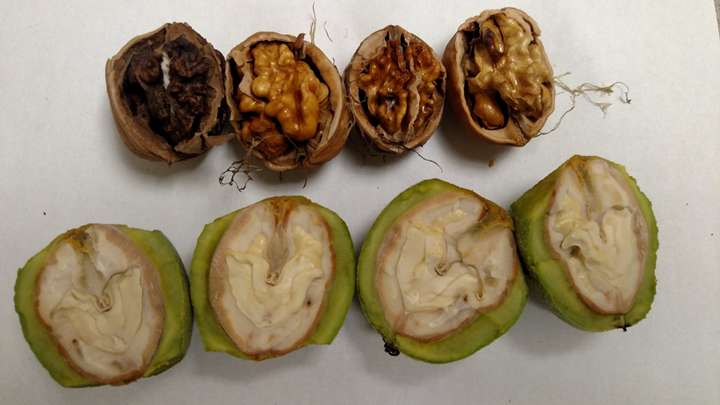 Below are some images comparing oilless Chandler nuts with ‘normal’ Chandler nuts from the same tree. Oilless nuts (bottom left side) have already undergone husksplit, while the unaffected nut (upper right side) is not splitting yet. Don’t grab the already split nuts to assess whether nuts have reached packing tissue brown. Photo credit: D. Lightle, 8/26/16. 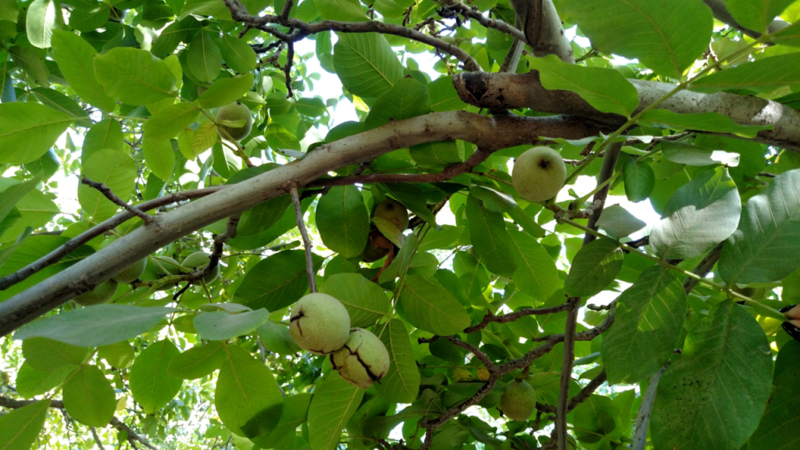 Oilless Chandler walnuts (top) and unaffected Chandler walnuts (bottom) from the same tree. Photo was taken on 8/26/16. Photo credit: D. Lightle. At this point in the season, it is important to recognize when you are looking at an oilless nut so that estimates of packing tissue brown (PTB) for ethephon application are not skewed. Oilless nuts should not be considered when surveying for the percentage of PTB. These nuts don’t have any value and any dropped nuts can be mowed prior to shaking the main crop so that they do not get mixed in with the higher quality crop.